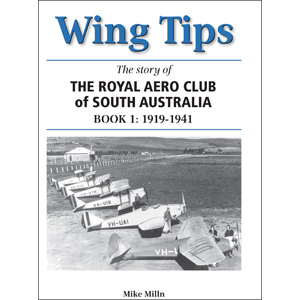 The history of the Royal Aero Club of South Australia is a fascinating one, reflecting South Australia’s rich aviation heritage. This volume, Book 1, covers the period 1919-1941. The book covers all the early trials and triumphs of the Club as it emerged from the ashes of the Great War, and is set against the background of exciting early days of record breaking flights and the birth of commercial aviation. The Club was at the forefront of Adelaide society, and many of its members came from Adelaide’s wealthiest and best-known families. As well, the whole cast and play of aviation pioneers are here – the record breakers from “Smithy” to Jimmy Melrose and Roy Gropler, and the airline builders from Joseph Larkin and Horrie Miller to Reg Ansett. The characters, the pageants, the air races, the crashes - and even the scandals – are all in this very readable book.